Soldiers of all ranks and classes compiled written records of their wartime experiences. Their diaries, letters, prose, fictional accounts, poetry, and memoirs constitute a rich and varied literary heritage. Many combatants violated military regulations by keeping personal diaries, often quite openly, writing in quiet periods at the front, at night, or during rest rotations behind the lines. The diaries recorded the minutia of daily military life, from the banal to the terrifying, and frequently chart dramatic evolutions in a soldier’s wartime character, from keen recruit to stoic veteran, for example, or from sensitive new arrival to resigned survivor. Some soldiers recorded events in great detail, illustrating their thoughts with sketches or exceptional narrative detail, while others skimmed quickly over events and great stretches of time. In addition to diarists, the Canadian Expeditionary Force also contained a great many amateur sketch artists who drew their experiences. 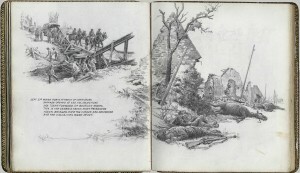 Hundreds of diaries and sketch collections survived the war, and dozens have since been published. The Canadian War Museum’s collection alone maintains more than 250.
Letters were the principal means of communication between friends and families at home and soldiers overseas. 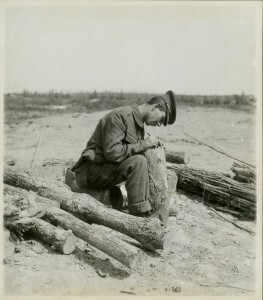 Conditions at the front often limited a soldier’s writing opportunities, and military censors reviewed outgoing content, but soldiers wrote millions of letters and cards during the war and received even more from correspondents at home. Because family and friends often kept the letters they received from overseas, contemporary researchers can access a vast and diverse archive dealing with conditions at the front, daily life, and personal concerns. It was much harder for soldiers to keep the letters they received from home because of the conditions of service and the inconvenience of carrying large quantities of paper. Letters were eagerly received by soldiers and civilians alike, and mail call at the front was often a very social experience, with troops sharing news, jokes, or small comforts. Bad news came too – failed marriages or infidelities, the death or illness of loved ones, or local catastrophes – but this vital connection to the supposed normalcy and stability of home was among the most important pillars of soldier morale and personal well-being. From the second year of the war, soldiers and other service personnel were writing personal memoirs. Some wrote with an eye on history, others with a thought of commercial profit from a public hungry for war news. Several important memoirs appeared after 1918, as well as some novels based on personal experience. Frederick George Scott, a noted poet, Fellow of the Royal Society, and wartime padre, immediately published a classic memoir in 1922, The Great War as I Saw It. Veteran Will R. Bird, a young Maritimer and failed store owner who had won a Military Medal with the 42nd Battalion, wrote several works extending over nearly 40 years. Commissioned by Maclean’s to write a series of magazine articles based on a return trip to Europe in 1931, he published three popular accounts during the Great Depression and, in 1968, Ghosts Have Warm Hands, a book still considered the finest Canadian memoir of the war. There was no organized oral history program for First World War veterans, although personal accounts and author interviews informed many historical publications, radio programs, and novels. Starting in the 1960s, the approach of the war’s 50th anniversary sparked widespread interest in historical memory and veterans’ recollections. A major project by the Canadian Broadcasting Corporation recorded and transcribed hundreds of interviews, an archive that remains among the war’s best oral collections more than 30 years later. 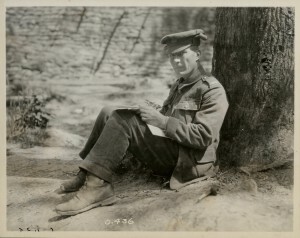 An unidentified soldier leans against a tree, composing a letter. Many First World War letters from soldiers overseas were saved by friends and family at home.